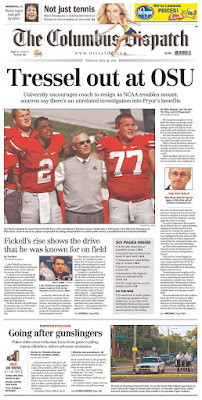 A look at front pages of newspapers in Ohio after Jim Tressel stepped down as Buckeye coach. Click an image for an enlarged view. With Jim Tressel stepping down at Ohio State, the 2011 coaching carousel got cranked up early. Bodog has posted odds on who might be the next Buckeye coach. The favorite is Urban Meyer at 3/2. Then comes Florida State assistant Mark Stoops (5/2) and ESPN analyst Jon Gruden (3/1). Also on the list are Nebraska's Bo Pelini (10/1) and Michigan State's Mark Dantonio (12/1). The Wiz of Odds is conducting a comprehensive study of bowl game expense reports. All of the data collected — expense reports for 56 teams and bowl surveys for 40 teams — are being posted on the site. Here is the latest installment. For an overview of the project, click here. The Little Caesars Pizza Bowl has been played in the Detroit area since its inception in 1997. It was formerly the Motor City Bowl. The game is privately held by Dilip Dubey, chairman of the game, and operates as Motor City Sports Inc., a 501(c) nonprofit. 2010 participants: Florida International and Toledo. Survey: Although the game is played in the hub of the motor vehicle industry, athletic director Pete Garcia said there was a shortage of courtesy vehicles. "We definitely could have used two more courtesy vehicles, three cars was not enough," Garcia wrote. Garcia also gave a "neutral" rating to the availability of practice equipment. Survey: Athletic director Michael O'Brien wrote no comments, but his responses to questions made it clear he wasn't overwhelmed by the Little Caesars Bowl experience. He answered "adequate" when asked of his overall impression of the event. And he gave responses of "neutral" on the availability of practice equipment and cost of rooms. First played in 2003, the Armed Forces Bowl is one of seven postseason games owned and operated by ESPN. The Dallas-area game is traditionally played at Amon G. Carter Stadium on the campus of Texas Christian University, but was moved to Gerald J. Ford Stadium on Southern Methodist University's campus for 2010 and 2011 because of a renovation of Carter Stadium. 2010 participants: Army and Southern Methodist. Survey: West Point officials redacted the name of the athletic director on documents sent to The Wiz of Odds. Kevin Anderson was Army's athletic director, but moved to a similar post at Maryland last September. Whoever filled out the survey was complimentary throughout and answered "very satisfied" on nearly every question. They did, however, respond with a "neutral" rating on the number of credentials issued by bowl officials. The person filling in the survey also noted they were "satisfied" with the ticket commitment and cost of game tickets. Southern Methodist: The private school refused to offer its expense report or bowl survey to The Wiz of Odds. The Bowl Championship Series title game is a stand-alone entity staged by one of the four BCS bowl organizations annually. The Rose, Sugar, and Orange fund the game through their 501(c)(3) organizations. The Fiesta has a special-purpose 501(c)(3) called the Arizona College Football Championship Foundation used to present the title game every four years. Thus, the classification is always 501(c)(3) (or public charity). The first game was played in 1999. 2011 participants: Oregon and Auburn. The Independence Bowl, played in Shreveport, La., is operated by the nonprofit Independence Bowl Foundation. It was named in honor of the United States' 200th birthday in 1976, also the year of the first game. 2010 participants: Air Force and Georgia Tech. Air Force did not complete a bowl survey. Survey: Athletic director Dan Radakovich is apparently not a fan of the Transportation Security Administration in Shreveport. "The bowl staff is probably not aware of the most unpleasant experience during departure at the Shreveport Airport," he wrote. "The TSA staff was inadequate in size and provided the most thorough inspection of each passenger ever experienced. It literally took 2 hours to process 190 passengers through check-in and there were no other people in the entire airport. Not a Bowl responsibility but nonetheless relfects [sic] on the final impression of the trip." Although Radakovich did not rate his level of satisfaction for the overall bowl experience, he expressed satisfaction throughout the survey except for two additional areas. The first was the number of complimentary suites, which he gave a "neutral" rating. "Georgia Tech could have used more suite rooms in the hotel than were available," he wrote. He also gave a "neutral" rating to the number of complimentary gifts for athletes.